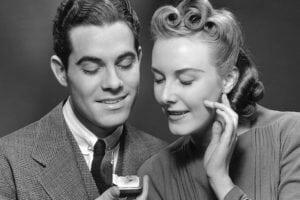 You need to buy an engagement ring, and you’ve done your research. You know how to shop for the ring: the question now is where? That all depends on what kind of experience you want. Are you looking to find a ring without getting up from your couch? Or to dive headfirst into the world of diamond industry trade shows? Your first task is to figure out what your priority is: Convenience, savings, presentation. Your destination will flow from there. There’s no beating the convenience of purchasing an engagement ring online. The benefits include super competitive prices, easy comparisons, and the ability to zero in on a specific Four Cs combo without having to visit a jeweler. Downsides include not being able to see what you’re getting in person before you buy and the fact that many women view the online approach as the antithesis of romance. 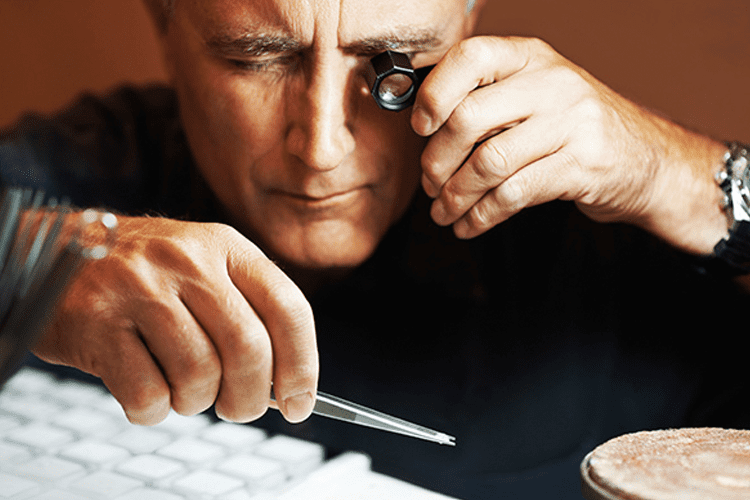 Avoid sketchy sites and stick to reliable retailers like Blue Nile. With the exception of some vintage and estate designs, all online engagement ring purchases should be accompanied by a grading report from a gemological laboratory that details the diamond’s Four Cs profile. Without it, you have no way of knowing if that diamond you’re eyeing is legit. 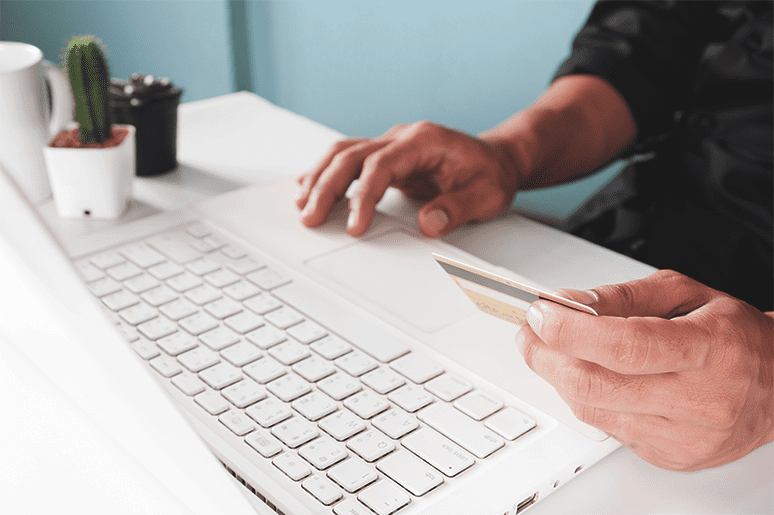 Shopping online doesn’t feel right—but you would like the process to be as quick and painless as possible. In this case, you should head to the mall. You’re probably already familiar with the Zales, the Jareds and the Kay Jewelers of the world. These guys offer location convenience and a wide variety of price points, even if your budget is under $1,000, or even $500. 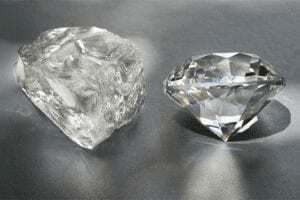 Downsides include limited and/or homogeneous inventory, zero flexibility when it comes to negotiating a price, and what some have decried as mediocre diamond quality. You can get a quarter pound of ahi poke at your local Safeway or from a fishmonger specializing in the freshest catches. While some may find the difference in quality negligible, others would beg to differ. Likewise shopping an independent “mom & pop” store has its merits, including access to hard-to-find designers, greater flexibility when it comes to customization and a better capacity to accommodate your budget. Stanley & Sons Main Street Jewelers Since 1912 or its equivalent is also a great option for those who are committed to supporting local businesses and see the value in forging a lifelong relationship with a trusted jeweler (and the personalized service that comes with it). The astronomical markup that comes with purchasing an engagement ring from a luxury jewelry house like Tiffany & Co. or Cartier is well-documented but for many, the product’s undeniable cachet—and the dazzling impact of proposing with hardware housed in a robin’s egg blue or red box—is well worth the extra coin. Eternally timeless, iconic designs, impeccable craftsmanship and superior diamond quality are the hallmarks of these marquee jewelers. 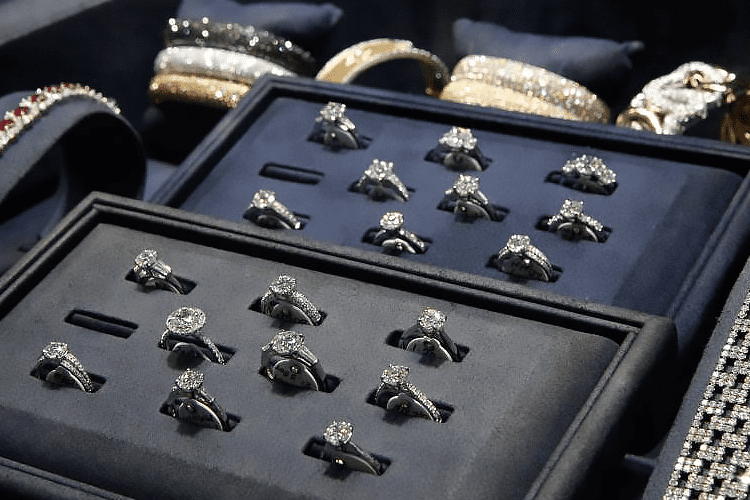 There’s a diamond district in almost every major city, from New York City’s famed 47th Street to Hill Street in downtown L.A. Intrepid bargain hunters head to these spots in search of loose diamonds or engagement rings at wholesale prices (a third to half off retail). Still, navigating all the booths packed into the various storefronts can be a bit of a headache so it’s best if you can get a pre-vetted recommendation from a friend. 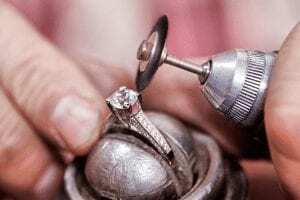 To be sure, there’s a certain gritty, no-frills aspect to doing your engagement ring shopping directly with a member of the jewelry trade—so make sure you have a handle on the Four Cs before you go. 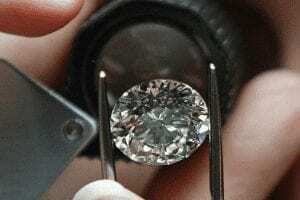 It’s also smart to price out the size and quality of diamond you want in advance. Jewelry retailers regularly attend industry trade shows and expos to acquire merchandise from designers and manufacturers to sell in their stores. Some of these shows are open to the public, allowing a regular dude like yourself to potentially score an engagement ring well below its retail value. In fact, a number of seasonally-occurring wholesale gem and jewelry shows, including a world-famous one in Tucson, Arizona are easier to find than you might think. Check listings at your nearest city’s convention center to see when any such events are scheduled. 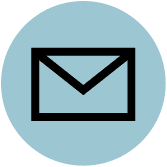 Some sellers require a resale number to grant you the wholesale amount, but the vast majority will offer you a deeply discounted price regardless. Whether you want to hang at home and shop online or go out and haggle with an expert, you have endless price, style and quality options when it comes to engagement rings.